“I have always been interested in understanding different cultures,” states Aracelis Francis. Although she grew up on the island of St. Thomas in the Virgin Islands, a U.S. territory, she has spent much of her adult life in the United States. Ms. Francis received her bachelor’s degree from the Inter-American University in Puerto Rico in 1960. Returning to her birthplace, she worked in the Child Welfare Division for the Virgin Islands’ Department of Social Welfare. To better her understanding of systems management, Ms. Francis soon began searching for a social work program at the master’s level. She considered Columbia University, the University of Pennsylvania and SSA as her top choices because their urban locations would offer an environment that contrasted with her island upbringing. She ultimately chose SSA because, although she was in the clinical track, she could take courses in supervision, administration, and community organization. Ms. Francis recalls that, despite her work experience in the Virgin Islands, the transition from her education at a small Puerto Rican college to SSA was trying. Beyond the initial difficulty, however, SSA’s full approach to social welfare broadened her goals considerably. It was the tumultuous 1960s, and new thinking and new opportunities were developing in the field. Ms. Francis enrolled in the Columbia University School of Social Work, completing her DSW in 1979. While working toward her doctorate, she joined Adelphi University’s School of Social Work as an assistant professor. Concurrently, she found a position with the Council on Social Work Education (CSWE) as a research associate addressing the lack of diversity and cultural understanding in the social work curriculum. She worked closely with Carl Scott, Associate Director of the CSWE. Through Mr. Scott, she was appointed chair of the Council’s Commission on Minority Group Concerns. As a result of the commission’s work, CSWE received a grant from the National Institute of Mental Health (NIMH) to launch its Minority Fellowship Program in 1975. The program would educate minority social workers at the doctoral level to teach in the social work curricula and conduct research. Mr. Scott served as its first director. In 1975, Ms. Francis returned home once more as the Executive Director of the Office of Planning and Development of the Department of Social Welfare. After nearly five years in that role, she was chosen for a highly competitive one year internship as a Health and Human Services (HHS) Fellow at the Office of Refugee Resettlement, in Washington, D.C. She would not live in the Virgin Islands again for almost 30 years. In the early 1980s, Ms. Francis became an assistant professor in the Social Administration Concentration at the University of Maryland, with teaching duties that included a course on racism and social welfare. In 1986, she succeeded Mr. Scott as director of the CSWE Minority Fellowship Program, and during her tenure, she became a “den mother” for many of the tenured minority faculty members teaching in schools of social work in the United States today. Recent records show that the program has supported approximately 500 candidates over the years. 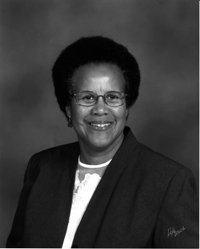 Ms. Francis retired in 2007, leaving the program as her extraordinary legacy to social work education.